Garrett Leight X Mark McNairy, Valdese - Charlie Need Help? Flipping out for Garrett Leight x Mark Mcnairy's newest flip-clip collab, the Valdese. Following the success of past collaborations together, Garrett Leight California Optical and American menswear designer Mark McNairy are back at it, with a fresh limited edition frame. The Valdese is offered here in the "Charlie" colorway. 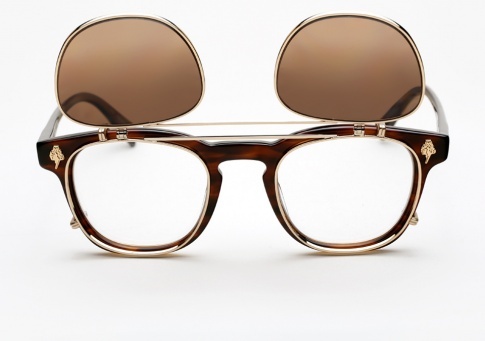 It features "Brandy Tortoise" acetate, with gold metal hardware, and silver mirror gradient gold mirror flip-up clip-on lenses. Every frame comes complete with a special edition box, hard clam case, and carrying pouch. Limited Edition collaboration with designer Mark McNairy. Comes complete with a special edition box, hard clam case, and carrying pouch.